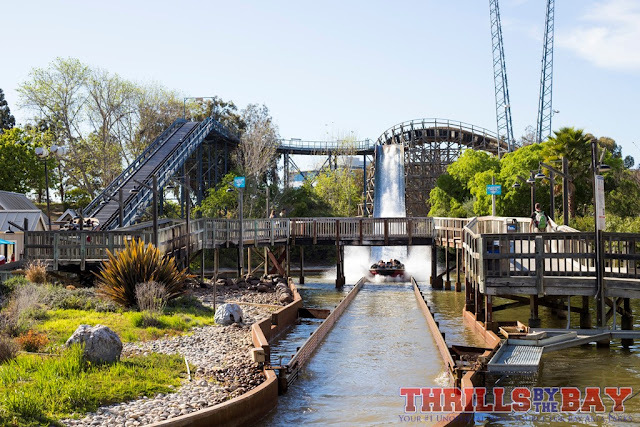 Thrills by the Bay: California's Great America Drop Tower - Fresh Paint in 2019! California's Great America Drop Tower - Fresh Paint in 2019! After a jam packed 2018 with midway improvements, new attraction, new restaurants, and a boatload of live entertainment, 2019 is shaping up to be a more "chill" season while making continued efforts to beautify California's Great America. 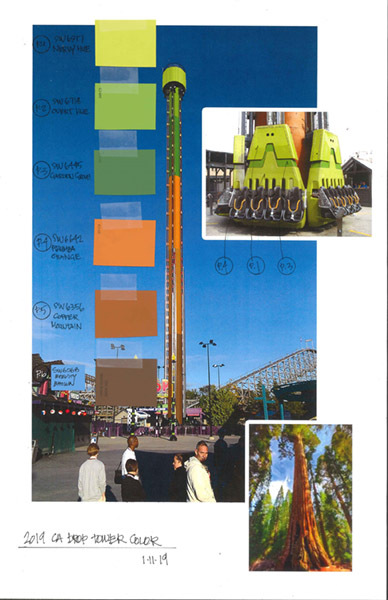 In a recent blog post from CGA, Drop Tower, the park's tallest attraction will be getting a brand new color scheme for 2019. The new color setup is inspired by CA's giant Sequoia trees, transitioning from a rich brown tone at the base of the tower to a vibrant green as you head toward the top. We think this new color setup will breathe fresh life into the area and will really stand out even outside of the park's boundaries. is from Canada's Wonderland, as evidenced with Leviathan's track to the right. Last week, the Base Painters crew was hard at work being hoisted up the tower to degrease and power wash the tower to remove all of the grime and residue that may have built up over the years of operation, to ensure a fresh, clean surface for the new paint to adhere to. As viewed from outside the park, you can see the paint crew at the top of the tower. a hint of orange that was once on the multi-colored tower. What is interesting is the fact that this isn't the only ride that will be sporting an outdoors-y California theme in the western side of the park. 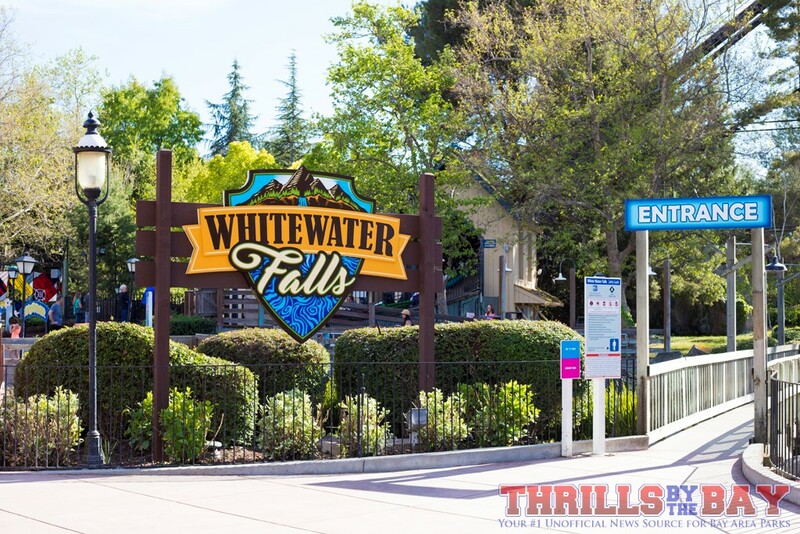 Last year, RailBlazer was the first in the area to introduce this California outdoors/nature theme, and neighboring rides Berserker and White Water Falls received new/updated main ID signs to fit in the theme giving the area a fresh look. Further down the midway, the old Fan-Attic store across from the Tooth Fairy maze was redone as "California Trails." Grizzly just happens to be a natural fit too, no pun intended. White Water Falls also received a brand new sign that fits nice with the area. This isn't the first Cedar Fair park to try and establish a fresh new theme to an otherwise aging area of a park. Carowinds is revamping on their areas as the "Blue Ridge Junction" to tie in with their new Copperhead Strike coaster, and last year, Kings Dominion freshened up their area around their Twisted Timbers attraction with the whole apple orchard theme. Knott's has also over the years freshened up their Boardwalk section and with the recent addition of HangTime, really breathed life into that area. Drop Tower opened in 1996 and at the time, it was the world's tallest freefall attraction on the planet. Drop Tower is a "2nd generation" freefall manufacutured by Intamin, who had also manufactured the defunct "1st generation" freefall known as "The Edge" which once resided just down the midway (where Thunder Road go-karts are now). 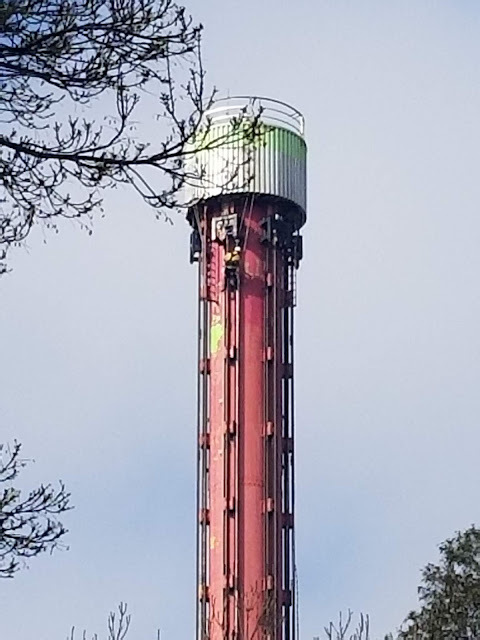 What are your thoughts on the new Drop Tower color scheme? Let us know in the comments below!